Local lawmakers in Seattle are poised to repeal a new tax on big businesses after receiving major pushback from local businesses like Starbucks and Amazon. 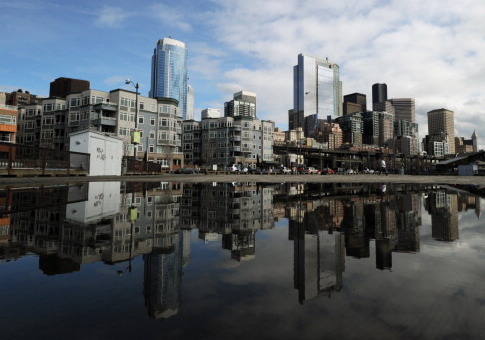 A statement from Mayor Jenny Durkan and city council president Bruce Harrell said they would end the tax on businesses that would have resulted in over $20 million in revenue, the Hill reports. The city had initiated the tax just weeks ago, which imposed a $275 per employee cost on 585 businesses in the city. City leaders wanted the revenue to address the city's growing homelessness and housing problems, but the city's largest businesses spoke up against the tax. Several big businesses, led by Amazon, which employs 45,000 workers in Seattle, objected to the tax. Amazon put a hold on projects that would have added another 7,000 new jobs in the city, and began exploring options to sublease thousands of square feet of downtown office space. Angry constituents also shouted down city council members at a public forum, a shocking departure for a city known for its cordial politics. At a rally meant to back the tax at Amazon’s headquarters, construction workers shouted down a pro-tax member of the city council. Business groups opposed to the new tax had already raised $200,000 for the fight and were gathering signatures for a referendum. "We heard you," the city's statement said. "This week, the City Council is moving forward with the consideration of legislation to repeal the current tax on large businesses to address the homelessness crisis." Seattle Metro Chamber of Commerce head Marilyn Strickland praised the turn of action from the city's leaders. "The announcement from Mayor Durkan and the City Council is the breath of fresh air Seattle needs," Strickland said. "Repealing the tax on jobs gives our region the chance to address homelessness in a productive, focused and unified way." Lorena Gonzalez, a city council member, blamed businesses for the tax's repeal in a statement, saying she was disappointed in those businesses. "I am deeply troubled and disappointed by the political tactics utilized by a powerful faction of corporations that seem to prioritize corporations over people," Gonzalez said. "It was my sound belief that a compromise on this policy had been reached with business, and as an elected official representing all of Seattle, I am deeply disappointed that certain members of the business community did not engage in good faith with the City of Seattle." This entry was posted in Issues and tagged Amazon, Tax Hikes, Taxes, Washington. Bookmark the permalink.